Mammy Maddox is how her grandson, Billy Jim Little, remembers her, but her given name was Angie Taye Ledbetter Maddox. This is her story. Angie Taye’s parents, Pleasant Hillary Ledbetter and wife Icy Ann Collins Ledbetter, had nine children in all. When Angie Taye was just 15, she married the first time to Lafayette Ledbetter. They had one child who died accidently at a young age. It is uncertain what happened to Lafayette Ledbetter, but by the time Angie Taye was 18, she had married a second time to Charlie Maddox. In time, there were six children born to Angie Taye and Charlie Maddox whose names were Arthur Maddox; Lula Maddox; Clara Belle Maddox; James Maddox; and Lois Maddox. One child died as an infant. 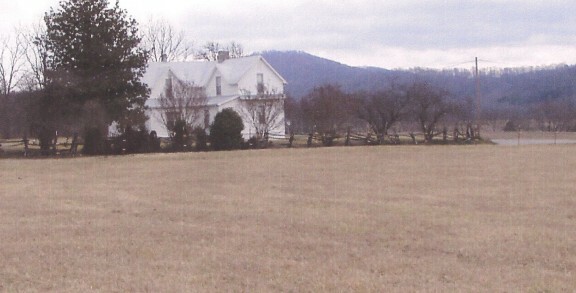 The Maddox family lived in a large, two-story log home on a 105 acre farm in the Collins Cove community. The house had a big fireplace where all the cooking was done. Dutch ovens would be used to cook in, and would be covered over with coals from the fire. Cast iron pots used to cook food such as dried beans hung from a metal arm in the fireplace, and could be moved back and forth over the wood fire. Charlie Maddox was a farmer and would often sell a beef cow for additional income. Other jobs he had included helping to build roads around this area, serving as a justice of the peace, and as a member of the county court, a position he held for many years. In 1912, the Maddox family moved into a newly constructed large, white framed house in Collins Cove that is still standing today. The property was sold in 1958 to Delta Ramsey. The old Maddox house still stands today, even though some changes were made by more recent owners. The original house had an L shaped front porch with two doors in front and a full straight porch on the back of the house. Even the direction the road ran was not as it is today. Billy Jim Little remembers coming for visits to the Maddox farm. Mammy Maddox bought him a small horse from Comer Burks, a nearby neighbor, and sometimes, Billy Jim rode the horse into town to take a bucket of cream to sell for Mammy. Someone from a creamery in Cookeville would be at a vacant lot on the square to buy cream. But most Saturdays, the trip to town would be made by mule and wagon to sell eggs, butter, and buttermilk to some of the merchants around the square that Mammy had standing orders with. A regular routine would be followed on Saturdays that started out by feeding and milking the cows, feeding the hogs, and getting the eggs, butter, and buttermilk loaded and ready to make the trip into town. Eggs sold for a penny apiece then which was considered to be a really good price. If corn was taken to town to be ground into flour at a mill run by a Reynolds family, it would have to be shelled before starting to town too. The trip was always planned in way that they would be sure to get back home before it got dark. The last stop made on the way home would always be to buy salt, coffee, sugar, and dried beans at Charlie Pop Poindexter’s store just down the road from the courthouse square. Being neighbors meant more back then than today. Farmers worked together for no pay to help each other when it came time to get in the crops. Gathering corn, harvesting wheat, hog killing, and making molasses were all done with the help of neighbors. A molasses mill would be set up at a spring near the foot of the mountain in Collins Cove, and everyone would gather there to make molasses. No money ever changed hands between the farmers for the work involved in any of these tasks. It was just understood that as the time came for each farmer’s crop to be harvested, everyone pitched in to help. In search of better paying jobs, Billy Jim’s parents, William H. Little and wife Clara Belle Maddox Little, moved north to Akron, Ohio. They, along with other relatives, would often come home for visits with Mammy and Pappy Maddox. During some of these visits, one thing Mammy Maddox loved to do, while everyone sat around the fireplace, was to tell the grandchildren ghost stories. Sometimes while the stories were being told, one or two of the grandchildren would be sent outside to bring in wood for the fireplace. While the children were out getting wood, Mammy Maddox would slip out and put a sheet over her head just to scare the children. She loved teasing them this way. Mammy Maddox was a good money manager, and was careful with the money she was paid from selling eggs, butter, cream, and buttermilk. But on one occasion, she had to pay Billy Jim a dime that she tried to get out of doing. She always cooked dinner around noon everyday, and after the meal was over, Pappy would rest for about half an hour before going back out to work. When Billy Jim was there helping with the chores, he didn’t like to sit around after the meal, he wanted to be up doing something. As a way to get him to rest after eating dinner one day, Mammy told him she would give him a dime if he would sit down and rest for half an hour after they ate. He wanted that dime really bad, so he agreed to her offer. But when the time was almost up, Mammy went outside and called for him to come see a pretty bird that was out there. Pappy knew what she was up to and told Billy Jim just to stay put. In spite of her coaxing, Billy Jim sat still and ended up getting the dime. For a period of time, the Cecil Lee family lived in Mammy Maddox’s home in Collins Cove. She lived in one side of the house, and the Lees lived in the other. Mammy Maddox felt especially close to Cecil and Ruby Lee’s daughter, Betty. When Betty was only 10 years old, Mammy Maddox gave her a double wedding ring quilt she had made. Betty today considers that quilt a prized and treasured possession. Around the time Mammy Maddox was 78 years old, Betty helped her relearn to ride a bicycle. Mammy had some years before ridden Billy Jim’s bicycle once in a while. Betty would hold on to the seat of the bicycle to help get Mammy Maddox started, and then give her a push. Betty said she would hold her breath while she watched Mammy Maddox ride down one side of the yard near the house, hoping she wouldn’t turn over. Another memory stands out in Betty’s mind about Mammy Maddox’s caring nature. Betty recalls that while her family lived in Mammy’s home, Mammy gave a black man permission to sleep in her barn. Betty said she was too young to remember who the man was, but she does recall Mammy having her carry food out and sit it down near the barn for the man. 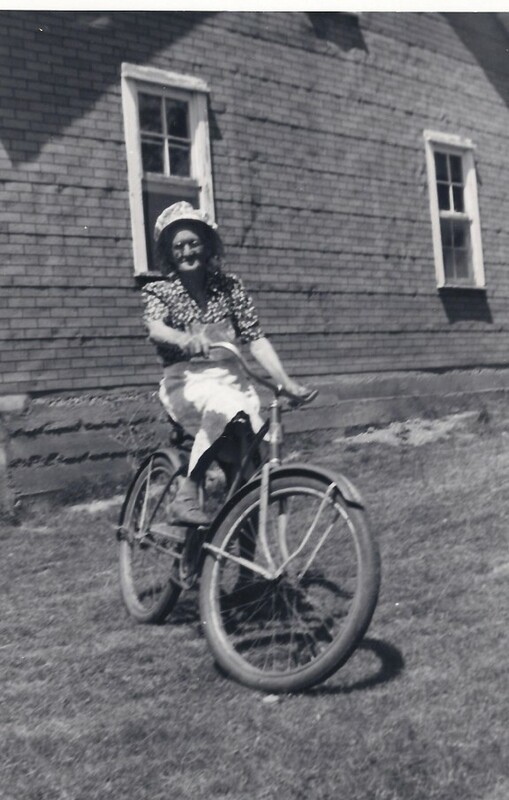 Mammy Maddox, age 78, was photographed riding Betty (Lee) Stephens' bicycle. Billy Jim remembers Mammy Maddox as being a very kind hearted person and one who was always a good neighbor. When she passed away, three vacuum cleaners were found in her home, none of which had ever been used, simply because a salesman had come by and she found it hard to turn that person away without buying the product he was selling. Joe Terry and wife Ellen Terry were neighbors that Mammy Maddox often shared her homegrown garden items with. If there was a needy family nearby, Mammy Maddox always did what she could to help out. She was described by others who remember her as being a very colorful character, and someone who loved to talk and visit with friends and acquaintances. The wonderful picture Betty (Lee) Stephens shared of Mammy on Betty’s bicycle not only speaks volumes about Mammy’s personality, but is proof that it’s so important to stay young at heart regardless of how many birthdays we’ve celebrated. It’s been fun getting to know Mammy Maddox through the memories of her grandson, Billy Jim Little, and her special friend, Betty (Lee) Stephens.